Moving into September and October, the energy of the spring horse racing season is building as the horse racing industry moves towards its most important events. This is the time of year when punters start scouring the Australian bookmakers list in search of the best free bet offers in Australia. Of course, punters are excited because any winnings they can derive from free bet offers from Australia based bookmakers can be used to punt on some of the nation's top horse races. Each racing season, Melbourne's top racing stables come together to present the 3-day Caulfield Spring Racing Carnival. The featured event of the carnival for the nation's best 3-year olds in the Caulfield Guineas, which is always scheduled to be run on the first Saturday of the carnival. As a classic event, the race typically draws many of the top 3-year olds in training. 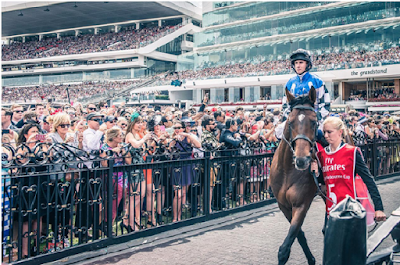 While the Caulfield Guineas is typically used as a stepping stone towards the Australian Triple Crown Races, there have been instances where the top horses from this event have gone on to test the WS Cox Plate with some success. Here's a look at the conditions of the race. The Caulfield Guineas is scheduled to be run on October 8, 2016 at the Caulfield Race Course in Melbourne. The race is designated for 3-year olds only with set weights. The race will be run at 1600 metres on turf for a purse of AUS$1,000,000. The Melbourne Racing Club has received 329 nominations for this year's Caulfield Guineas. First acceptances are expected to be announced on September 8 with second acceptances scheduled to be announce 12 days later on September 20. The final barrier draw will be held one week before the race. Here's a look at a few of the top nominees. Divine Prophet (Odds: 9-1) - After running third in last season's Moet & Chandon Champagne Stakes (G1), Divine Prophet opened this season with an impressive win in the Primo Smallgoods Up And Coming (G3) at Randwick. Assuming everything goes well in the upcoming Golden Rose (G1), this one could enter the barrier as one of the favorites for this prestigious event. Saracino (Odds: 15-1) - After breaking his maiden last week in the Foxbridge Plate (G2), Saracino's connections have made the decision to invade from New Zealand and take a shot at one of Australia's top prizes for 3-year olds. Prized Icon (Odds: 21-1) - Trainer James Cummings began pointing for this race after Prized Icon won the first Group 1 of his career in last season's Moet & Chandon Champagne Stakes (G1). The colt began this racing season with a useful fourth in the Primo Smallgoods Up And Coming (G3), which should serve as a nice prep for his yet to be determined tuneup for the Caulfield Guineas. Sacred Elixir (Odds: 9-1) - To date, most of the top bookmakers on the Australian bookmakers list have this one rated towards the top. After finishing the 2015-16 racing season with a big victory in the Bmw J.J. Atkins (G1), the connections of Sacred Elixir set their sights on a possible run in the WS Cox Plate. The first step is scheduled to be the Group 3 $175,000 Caulfield Guineas Prelude (1400m). If all goes well, it's on to the Caulfield Guineas at which time trainer Tony Pike will have to decide whether or not he wants to test superstar Winx in the Cox. For more information, punters are encouraged to buy the form guide and stay current with any news leading up to the Caulfield Guineas and the Caulfield Cup to be run one week later.